Should I major in music? Does it make sense to spend the next four years of my life plus all that tuition to study music in college? There’s a big difference between singing or playing an instrument in high school, even being told you’re good enough to make All-State Choir or Band –– and deciding to become a music major when you graduate. The bottom line is this: Do you want to major in music because it’s your calling, because you are so passionate about music that you are willing to take on all it requires to make it the focus of your life after high school? It’s a myth that majoring in music is easy and fun, compared to engineering or pre-med or business. …and you get a bird’s eye view of what you are stepping into as a music major. BUT if music is your calling, it’s all achievable. And yes, you will enjoy it, or most of it, and you will feel like it is the right thing –– and probably the only thing –– for you to be spending so much of your time and your (or your family’s) hard-earned money on at this point in your life. As with any major, time management and the ability to organize yourself will pay off more than you would ever have imagined. It’s also essential to continue to think ahead about what you might do with your degree. Many schools offer classes and even entire tracks that teach the business skills most music majors will need at some point in their careers in order to be successful. If you think you’ll want to teach, check out pedagogy requirements. Even subbing for a music teacher may require you to have some music education classes under your belt. I’m a senior dually enrolled in high school and college, and I need to decide on a field of study for VR to pay for my education. I’ve been in choir since 6th grade, taken individual voice lessons for a few years, and have made it into regionals, all state, and all-national choir. I was in the two top level choirs at my high school last year and also in AP Music Theory, which I took the test for and got a score of 4. I’m thinking I want to major in music education and vocal performance because music is my calling and I’d love to work with kids (preferably on the older side) on learning music skills. However, my parents are saying I’ll have a hard time finding a job as a choir director and should probably study something more math heavy cause I’m good at that (even though I barely passed precalculus) and it’s the way of the future. Music has always been my life and I can’t see myself going into anything other than music, but at the same time I’m worried everything that I’m being told right now will turn out to be true and I will regret my decision. Any advice? Ask the head of the music education department at your university about the percentage of majors find teaching jobs when they graduate. Many schools tell us that 100% of their students find employment in music education upon graduation. We encourage you to read all of the music education articles here on MajoringInMusic.com – there’s great information about finding a job in music ed. Music is not an easy career field but if you’re as passionate as you say you are, it sounds like you’re the kind of person that should give it a go. This article, “A Career in Choral Conducting” would be worth reading. Also note that as a music major, you gain many skills useful in any career field. Read this Transferable Music Skills article to learn more, and be sure to share this with your parents. I’m a senior that has to prepare for the upcoming college applications and for the longest time, i thought of double majoring in computer science and music. Computer science for the high chance that i will be successful; Music for my passion. I’ve played trumpet in an all city band and have taken up learning piano on my own. I don’t have resources currently, so im below average at best in my playing skills in both trumpet and piano, but i still try to learn what i can. My question is, should i really take up music? I’m doubting my abilities as again, i wasn’t really taught much. To major or double major in music, you would need to pass an audition. Look at the audition requirements at schools you’d be interested in applying to. Do you have the skills to pass these successfully? Do you have a foundation in sight-reading? Note that students who love music but who don’t have the proficiency to major in it have lots of other options at most colleges and universities where they can minor in music, take elective music classes, take lessons, and join ensembles, jams, etc. At liberal arts colleges, where students need a strong high school academic record to be accepted, you typically wait until your sophomore year to declare a major or double major – which could allow you to take music lessons and music theory in your freshman year to see if majoring in music is really the right fit. Why not find a few classes to take to clarify your interests and help you decide on next steps? That way you’ll get a better understanding of the areas you’re interested and whether it really makes sense to switch directions. And keep on singing! Do you have to play a classical instrument to get a major in college or could it be any instrument? No. It all depends on what you want to study. Use the Find Your Major section of MajoringInMusic.com to get ideas and then check application and audition requirements at schools that catch your eye. I have been in band for almost 7 years now and I love my primary instrument alto saxophone though I feel I lack the motivation to practice on that instrument. I have also just recently been learning to play the piano and I am excelling pretty well and have the motivation and passion to keep playing and practicing on piano. My only issue is though that I feel I will not be prepared for a college piano audition as I am already a junior in high school and don’t have much time to perfect my piano techniques. I know that there are schools that do not require audition but the more prestigious ones do, as I would like to attend a very good music school. I have a strong interest in music production, composition, and performance but feel it is not practical for me because I do not have a natural talent for music like some of my other friends who pursue music. I am debating having a music major and just don’t know if I am truly good enough or have what it takes since I would like to make piano my primary instrument but I am not proficient enough at it. You’re right – to be accepted at most schools, you’ll need to audition. We strongly encourage you to look at the audition requirements on college websites. You’ll see what you’d need to be ready to do if you were to pursue auditioning. Students find that attending a summer music program helps them improve their proficiency – but it also takes daily practice as well. So if you are not inclined to work that hard, you can always look at minoring in music – you may still have to audition but typically not until you’re already at college and then mainly to see which level of band or ensemble you’ll be placed. You can always try out for marching band, get lessons and continue finding opportunities to perform with others even if you don’t major OR minor. So if you love music, make sure you keep it in your life – in college and throughout your life. I have played the tuba since 6th grade and this year I am graduating high school and want to pursue a double major in music which is music performance and education. Due to financial problems I will unfortunately be attending community college and not a 4 year university. Me question is… will I fall behind in my major if I attend a community college for 2 years and then transfer to a university? Attending a community college can be a great way to pursue a degree in performance and education. Pay attention to the information in this article (Community College for Music) so you don’t end up wasting your time or money. Do I need to do any crazy math to major in music? You may be required to take a math class as part of your general education requirements – you’ll need to check required classes at the schools you’re interested in applying to. Music theory – and a few semesters of it – is required in any performance-oriented music program. It is mathematical but different from a standard math class. I am an up and coming senior. I have always loved band and choir and started on percussion, then freshman year I switched to French horn, except our school is very small and doesn’t have a double horn. We are getting one this year finally, but I don’t know my chromatic scale, and I need to relearn the notes. This year as a junior I learned clarinet, self taught in a week and learned my chromatic, but I’m not very fast on either of the instruments and fast fingers are definitely required for music. I learned how to read sheet music sophomore year and have been working on a solo for clarinet and French horn. My question is, I’m worried I’m not good enough to pursue music education with how tiny our school is. I feel no matter how much I practice, no matter how good I get I still don’t compare to others in my class who have stuck with their instruments since 5th grade and gotten good at them. I want to be a music teacher but I don’t know how I can be when I don’t know the bulk of my theory or of the instruments I play. And I’m super stressed because nothing interests me as much as music does. You will need to audition on a primary instrument if you want to major in music education. So now is the time to decide which instrument that is, find a good teacher who has a good reputation for helping students prepare for successful auditions, and get a consistent, efficient, and effective practice schedule going. Look seriously at taking a summer music program to help you in this process. Many offer music theory in conjunction with lessons, performance opportunities, and much more. You have the necessary passion- now focus on technique. I have been playing the piano for 12 years and next year I am about to choose a university. I am really passionate about music but not as much in teaching. Will majoring in music give me opportunities to become a performer, a conductor or a composer? And, will I be seen as a university graduate after I have finished or will my academic knowledge be considered low on fields other than music? Will I lack the physics, biology and other subjects knowledge I will need to succeed in society? I am asking this because most Greek well-known musicians these days have a major in something other than music. It all depends on the school you choose, which major, whether you get a BA or a BM degree, whether you take a double major, whether you go to a university, liberal arts college, or conservatory. Look at articles on this website about all of the above to help you narrow your choices based on what you want to do and see yourself doing after college. Simply put, I’ve been playing guitar entirely self taught for about 9 years. I can’t read music, don’t know the first thing about music theory and have never had the opportunity to take any sort of formal music training. I’ve learned entirely through guitar tabs and by ear. What I’ve been trying to search for is a definitive answer to this question: will a music college teach you from the ground up, or must you already be proficient in understanding and performing music on an instrument to even consider applying for a music major? Majoring in college-level music at a conservatory-model program advances one’s previous knowledge, skills, and training. But liberal arts schools often have good B.A. music programs that don’t require an audition or prior music training. If you love music but have no background, consider a liberal arts college. Or look at taking private lessons, music appreciation, music history, world music, and theory for non majors as well as any other classes offered to non-majors at a university. I’m a freshman in an engineering major, but I’m changing the major next year. I haven’t decided which one at all, but I’m quite interested in music theory and dream of becoming a musician. I can sing pretty well and took a singing class last semester, but that’s it. I don’t play any instruments yet. I’m joining a guitar class this semester, and I’m a fast learner, but I don’t think that’s enough to get in a music major. I’m also worried about well-paid job opportunities and competitiveness if I happen to choose music. Do I have any chance? How do I know if this is what I should pursue? We suggest you read this: “Meeting the Challenges of Music Theory” and the related articles listed on the left side of the page. Music theory is required of all performance-related majors as well as composition majors, music history majors, and musicology/ethnomusicology majors. To work in a music theory-related career, you’ll likely need at least a master’s degree. We suggest you look at the required classes as well as the application/audition requirements for music theory majors at your school and at other schools, to see what’s realistic. We also suggest that you talk with music theory faculty at your school to get a better sense of what this field is really about. It’s likely that you’d be able to take one or more music theory classes in addition to taking lessons as you already plan to do even if you don’t major or minor in music. I am an upcoming senior and I plan on going to Georgia College and State University to major in music therapy. Some of their course load consists of “elementary music theory” all the way to “advanced music theory 2”. I have been playing the piano for 5 years and guitar for 2 years; however, I only know the very basics of music theory. I took an AP music theory class for about 3 weeks junior year and was dropped from the course bc I couldn’t read music well. I have a passion for music and I can’t picture anything other than having a career as a music therapist. I plan on taking music lessons this fall to better prepare myself for the audition into the music program; however, should I consider another career considering the fact I can’t read music well. As I said before, the course consists of a lot of music theory classes and I’m just afraid I’ll do terrible in them and in result not qualify for a degree in music therapy. You’re right: college-level theory courses are demanding. You say that you’ll be taking music lessons this fall – find a teacher who will also be able to weave in some music theory as well. The more you can learn now, the easier it will be when college-level theory classes kick in. Before you change your plans about music theory, see what you can learn before you have to apply and then audition. I will be a junior in the fall and that will be my sixth year playing flute. I have always excelled because I have such an interest in music, and have gotten told by several people that I will go far with my talent. I am very dedicated, love competition, and don’t stop practicing until I have it the best I can make it. I am learning piano, as well as wanting to learn clarinet. Ever since I could remember, I would come up with melodies of my own, then with instruments later on compose my own songs. I have a talent for playing and composing I think. The problem is, although I love music and have seriously considered majoring in it, my parents don’t approve. They say I’ll lose my love of music and it’ll just be about getting the spot or being perfect at flute, not enjoying the music you can make. Yet, my friend is more involved than I and has said every professional he talks to disagrees with my parents. I have been taking flute lessons for several years now with an excellent flautist, and I have gotten many great spots in All-County and All-District, hoping to make All-State this year. But I’m just so confused, I don’t know who to listen to or what to do. I am afraid of making the wrong choice. Like, if I choose a different career, I might always regret it. Or if I choose majoring in music, what my parents said might come true. Also, my parents said I will have no money and will have to get a second job, but I have always wanted to teach flute lessons but would that be enough to live on? I really need to decide what to do before my senior year so I can apply for applicable scholarships for whatever degree I choose. Do you think I should major in music? You’re in a tough but not uncommon position. We understand your parents’ worry – and we certainly understand your desire to pursue your passion. We suggest you take a look at articles in the “Answers for Parents” section of MajoringInMusic.com – you’ll find useful tips for talking with your parents. Your parents will likely want to know about the “Transferable Skills” music majors learn, so be sure to check that article out. Preparing for a career in music does require that you learn how to get your music out into the world, so read about Entrepreneurship Training for Music Majors to prepare yourself for what lies ahead. I am a junior in high school and I took a music 1 class and I joined the full band this year. I decided a while back that I would love to be a music teacher. In a year and a half of playing music I have gone from not being able to read music to getting two superior ratings in solo and ensemble and I was inducted into our music national honors society. However I am unsure of my ability to major in music due to my lack of experience. Any advice? You will need to audition on a primary instrument in order to be accepted to a music education program. So it would be a good idea to start preparing for that as soon as possible. There are still summer music programs with openings – we highly suggest you check them out. Lessons, lots of practice, performing, and preparing audition repertoire are important to focus on. You may want to take a summer program at a school you’re interested in applying to, so that you can get to know them better – and they can get to know you, too. Check our Summer Music Camps & Programs page for suggestions. The answer to your question depends on 1) What you want to do in your career; 2) How proficient you become on your instrument based on your lessons, practice, performance experience; 3) How you learn to promote yourself and your music (entrepreneurship skills, business skills). We also suggest finding ways to build your self-confidence and lessen performance anxiety. We also suggest looking into summer music programs that will give you focused study on your instrument and opportunities to perform with others. I’m currently a junior in high school. I’ve played clarinet for 7 years, can sing pretty well, and am taking up piano this summer. I have perfect pitch and have been told I should take advantage of this by putsuing music after high school. I am considering a double major in biochemistry and music, but I’m unsure if I can handle the workload of both these fields at once. I am very passionate about music but I also would love to research biomedicine as well. Am I setting myself up for failure if I undertake two rigorous majors? There are other ways to keep music in your life as a college student and beyond – even as a non-music major, you’ll find ensembles and the marching band to play in; choirs and a cappella groups to sing in; private lessons with students and faculty; and music electives to take. You can also explore the option of a music minor, offered by some schools. I’m a junior in high school, and I’ve played piano for 9 years and clarinet for 6. I took piano lessons until last year, deciding to stop my lessons because I am busy with band (drumline too) and schoolwork and I wasn’t practicing enough to validate the money being spent. I’ve been taking clarinet lessons since freshman year. I definitely would major in piano over clarinet, as I love the piano more. I have played piano in musicals at my school and did National Guild Auditions in my last few years of piano lessons. I would love to play piano in a musical pit on Broadway (if dreams could come true). However, I’m worried that it will look bad that I no longer take piano lessons. I still play regularly, but I play less classical songs and have learned how to improvise more as well as sight read very well. I guess I’m worried about the audition process and entering in if I were to major in piano performance. I haven’t completed Certificate of Merit, let alone level 10. I’ve chosen to devote myself to learning other instruments like the marimba for drumline, which I think has helped me grow as a musician. Do colleges of music take into account things like Certificate of Merit and Guild when letting you in? Your audition will be the most important factor in whether you’ll be admitted. 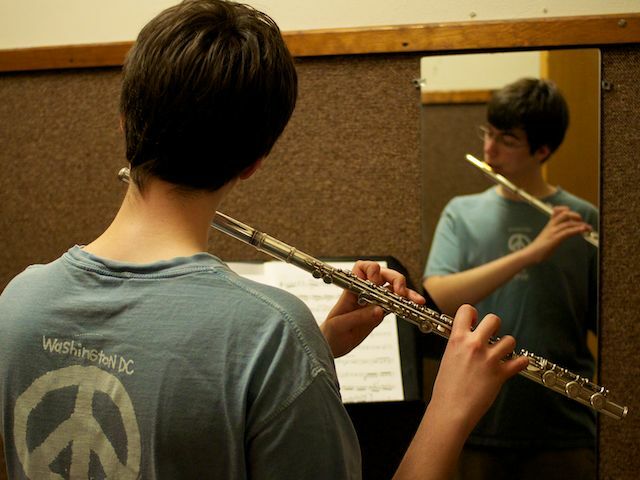 So we recommend focusing on the instrument you’ll audition on – which should be the instrument you’re strongest on and want to pursue in college. Summer music programs provide excellent preparation for auditions – no school work to get in your way, great mentors, lessons and practice and performances, and even opportunities to check out a school you might want to go to. Visit our Summer Music Camps & Programs page – many of these programs still have room in them but you’d better move quickly if you want to apply. I am a junior in high school. I grew up doing musical theatre and always thought of being on Broadway. I always said that if I could do anything else I would want to be a teacher. Lately, I’ve been thinking that I want to major in Music Education. I can read music and I’ve always been a singer. I am great with kids and I’ve even been assisting in teaching a class of second graders for the past 3 years. My only worry is that I don’t play instruments. I’ve been reading articles on the Internet a lot lately and they all talk about instruments. I know the basics of the piano, but I’m not a piano prodigy. Can I get into the Music Education program if I don’t play an instrument? I plan on learning the guitar in college to help. I just want to know if it is enough. That is my only problem. As a music education applicant, you will need to audition on an instrument or voice. And every music major needs to learn piano. 1. Look at the application and audition requirements at any school you’d consider attending. If any of those schools participate on MajoringInMusic.com, this will be easy – just look on their pages on this website. 2. Look at the requirements to graduate from each school. 3. Contact any of the schools you’re still interested in and ask them any questions you can’t find answers to on their websites. Again, if any of those schools are on MajoringInMusic.com, you can use the forms on their pages for your questions. If I major in music business will I have to take classes where I have to play music? That’s not what I’m interested in doing. I want to go more the business side rather than performing. It all depends on which school you go to. So look closely at admission requirements – look to see if there are audition requirements, look at required classes, and also look at business schools within universities and whether you can do what you want to do there. I am a junior in high school currently and I want to major in music and also become a psychiatrist. Do you think that that is possible with the 8 years required to become a psychiatrist? We can’t say how long it will take you – so much depends on your ability to pursue a dual major, your grades, your interests and where they take you, your school requirements, etc. But we can tell you that a background in music opens the door to so many insights, knowledge, and skills in conjunction with a path like medicine. Read this article about Music or Medicine: Great Tips for Doing Both to learn how training in music and medicine can fit together. I’m someone who made the mistake of studying music. In general, I do not recommend it as a major. I do not say this because it’s difficult. I tend to agree with studies that indicate it is one of the easiest majors, and unless you struggle with pitch identification, there’s really not much to trip you up as long as you’re willing to put in the practice time. Music theory is easier than algebra. The first real problem with majoring in music is the job market. When you study music, there is only one reasonably solid career path you will be opening up to yourself – teaching. Generally speaking, this is a strong sign that a particular skill isn’t very marketable. If the only place you can likely count on making money with a skill is in teaching that skill to others, that’s a sign that the skill has limited demand. Music, unlike other art forms taught in school, has not followed society’s demand. And as much as high school teachers love to tell us to follow our dreams, in a functional society, it’s important to recognize our own responsibility to provide services that people want and need. In terms of teaching jobs, music has been such a popular major that work can be difficult to find. To be sure, society does need music teachers. But it doesn’t need as many as it already has. Furthermore, some of the most flexible types of teaching jobs, such as private lesson teaching, don’t really require degrees, particularly for the instruments which are in the most demand, like piano and guitar. Related to the limited direct career paths for music majors, studying music will also leave you with limited skill transference to other careers. The courses you take in college are heavily biased towards music, even more so than with other majors, and the core general ed classes required are too basic to make you directly suitable for other fields. What this means is that if your interest in teaching music fades, you won’t have any clear, quick paths into different areas that you find more interesting. Because of this, I think it’s generally unwise for young people to jump directly into a music major. It lacks flexibility and forces you into a narrow, competitive, low paying field with few options if you change your mind. A better overall strategy for most people at this age is to focus on core skills in math, science and writing and WORK on developing new interests. I really mean that last part. The difference between the people who really make it and those who don’t is simply a matter of drive. Make your interests. Don’t just count on having them. People who love performing, composing and teaching music, as I did and to some extent still do, are often people who can be effective in applying themselves to many areas of study. Interests are things we create and cultivate, not simply things we are born with. If you can spend 4-8 hours a day dedicating yourself to an instrument or composing orchestral scores, you likely have the potential to be fascinated and committed to many endeavors. I believe it makes sense to try a few while your mind is still young and flexible. You can always do music on your own. And, if after giving a few other things an honest try, music is still your only calling, you can easily come back to it. Majoring in music at 24 years old is no worse than 18, and by the time you graduate, you’ll instantly appear as a more mature teaching candidate to any school district. Youth is no advantage for a teacher. It IS for many other fields. Thank you for sharing your concerns. It sounds like majoring in music may not have been the right fit for you, and that the transferable skills most students gain in music school either were somehow not a part of your undergraduate education or were not provided in a way that allowed you to apply them to whatever you were looking for when you graduated. We would also venture to guess that the entrepreneurship skills that more and more music schools are now either requiring or at least offering to students were not a part of your curriculum. It’s always unfortunate to hear about music school grads whose experience was more or less in a sort of vacuum, without attention to how to apply it to life after school. We hope others will respond to your comment but until then, we have a few responses ourselves. If music is your passion, we hope you’ll take a look at the new article on entrepreneurship on MajoringInMusic.com – music as well as business schools offer relevant summer programs, certificate programs, workshops, and other opportunities for those who did not gain these skills in music school. We agree with you that consistent “drive” is really important in being able to establish a viable career in music. Creating a career in music starts as soon as a music major enters college. They must have their antennae up at all times for opportunities to perform, collaborate, intern, explore new areas of music, attend concerts, etc. Can you cite the studies you refer to that show that music is one of the easiest majors? We’re not aware of them. In fact, we’ve talked with many, many students, music faculty, and alumni of music schools who say quite the opposite. We encourage you and anyone reading this to take a look at the article on transferable skills on this website. The key, of course, is to be able to talk about what you learned in music school in these terms. While music theory, history, and applied music lessons do not in themselves provide transferable skills, the collaboration, planning, ability to juggle many commitments simultaneously, leadership, improvisation, and creative thinking abilities that music majors learn are the key essential skills for most jobs in any field. As for jobs in music education – we talk regularly with plenty of music schools with a 100% hiring rate of their grads. If you check our article on “What Can You Do with a Music Degree?” you’ll see many other music careers listed. With the world of music changing so quickly, new careers are springing up as music grads see needs and opportunities to which they can apply their skills and create something that’s never before existed. Unless you’re a child prodigy, I would not recommend majoring in music. I am in my senior year of high school right now and I took piano for six years before I had to move. I haven’t exactly read music for piano in a while either. However, I did become obsessed with playing guitar. I haven’t taken any lessons since I started, but I have taught myself all the main chords. I have been teaching myself for 3 or 4 years now. I have suddenly become very interested in furthering my knowledge with guitar. I think it would be great if I could some day lead a church in worship. Do you think that with my level of knowledge with guitar that it would be worth majoring in music? Majoring in music is a huge commitment. We suggest you read more of the articles on this website to get a better sense of what you would face in auditions as well as if you were to be accepted as a music major. One way to get feedback on your current level of proficiency would be to get a lesson from a grad student or faculty at a music school where you’d consider applying. Also talk with your own church to find out what you’d need to do to get hired to play music for their services. I am going to be a senior in high school, and my college apps are coming up soon. Right now, I have no idea what I want to major in in college or what I want to do in the future. I have been playing piano for 10 years under the instruction of a piano teacher, and completed level 10 Panel in the California Merit Exam. My mom wants me to double major in music and possibly computer science, engineering, or business, because at this point I do not exactly know what subject I am interested in. She said that when I go into the school, after taking the pre-reqs I will be able to see what I am actually interested in. However, I am intimidated by the workload that double majoring will be. Also, I know for sure I do not want to major in med. I really want to get into a UC, preferably UC Davis (I want to stay in California) and I was wondering if the UCs have good music programs. Is it recommended that I go in with a double major for music and comp sci in a UC? Also, would it be easy for me to transfer into a different major in the UC, if I go in with music major? When do the audition processes for music major usually start? Could I audition even if I’m not sure what major I am going into the school with? If I were to major in music, is it recommended that I complete level 8 in ABRSM Royal exam? Sorry for the loads of questions, but if you could answer them, I would greatly appreciate it! We suggest you look at the websites of any and all UC schools you’re interested in – check out their application and audition information in particular. If the timing for auditions is not yet available, check again in another few weeks. See if you’ll also need to send in a prescreen to determine whether you will be offered an audition. Then contact the admission offices with any questions that the websites don’t answer. Note that not all schools offer double majors, and some require 5 years to complete double majors. Many schools also offer music as a minor for students who want to keep up with music without feeling intimidated by the workload especially in conjunction with another field. Next year I will be a senior in high school. I’ve played clarinet for technically 6 years, but really only about 2 because I honestly didn’t know how for the first 4 years. This past year though, I really buckled down with music. I became first chair at my school, I’ve participated in a local solo and ensemble contest and earned a superior rating, I earned the “outstanding musician” award at my school, was a soloist for our school’s spring concert (which was a jazz medley), and also played for another high school who was putting on a musical that didn’t have any good players at their school. A week ago I got accepted into a local youth orchestra, and now I am currently the youngest player in a local concert band which is filled with professional players who are a lot older than me. Anyway, recently I realized that music is my calling. I love playing music and listening to it and nothing else makes me happier; and I am willing to put in the time. But despite all the success and experience I’ve had this past year, I don’t think I have what it takes to major in music yet. Music majors have years and years of experience, while I only have 1 or 2. And I barely have any knowledge of music theory or history and I only play one instrument (I might learn the alto sax if my friend will lend me hers), but I’m just not sure I’m cut out for majoring in music. To sum it all up, I started a little too late and I don’t have much time. Any advice? It sounds like you’re working hard in the area you’re passionate about and you’re seeing the fruits of your labor. Congratulations on all of your successes. Let those help boost your confidence. Use the summer and fall to strengthen your performance skills in preparation for auditions. Read articles on MajoringInMusic.com about what majoring in music is really all about. Take a lesson with a college you’re interested in and get feedback about your proficiency level. Then go back to your original question and ask yourself whether you’re cut out for majoring in music. I’ve played piano with a private teacher for many years. I’ll be a sophomore in the fall of 2015. I play percussion in the band at my school and I’m on the drumline. I’ve been in community bands at local colleges. I want to be a high school band director when I am older. I’ve been out of private lessons for about 9 months because there was some complications. I’m afraid that growing up around percussion, I won’t have enough knowledge of wind instruments to be successful. My current director said I’m one of the best freshman he’s seen in years. Is it worth pursuing a music career with how little knowledge I have? There’s still time! Check out the 2015 Summer Music Camps & Programs page for band programs (look at the geographic listings for what each program offers) –– some probably still have room for you. If it doesn’t work this summer, be sure to register earlier for next year. Keep working on the instrument you plan to audition on so when you come to your senior year, you’ll be well prepared. Also look at summer music leadership programs such as the one offered by Syracuse University. And talk with current music majors who have the same career goal as you to learn more about what’s expected of them when they audition as well as once they’re already majoring in music. Most are probably music education majors, since that’s the likely path to get where you want to be going. I’m a senior in high school right now and I’m a pretty good guitar player and a pretty mediocre piano player. I love playing / creating music, yet I’ve never taken any music related classes or lessons. Should I even consider majoring in music if I wasn’t in band or choir? Do people who major in music almost always have band / choir experience? Music schools typically require you to audition. And those who audition have typically taken private music lessons, played in the school orchestra or band or youth orchestra, or performed solo and with their own band, as well as taken summer music classes and programs. In other words, they’ve had a strong start in music already, and are majoring in music to deepen their level of knowledge and heighten their level of proficiency. College music programs also require several semesters of music theory, and to survive it, it’s ideal if you’ve had some music theory before your freshman year. Note that you can always take a music class or classes in college, join a band, compose, etc. In fact, we highly encourage you to do all of that. There are many ways to continue your passion for music and keep it in your life. Can you be specific as to whether or not, even if you already have a natural performance skill set, you really need to major in music if you plan on being a pop, rock, or even country singer. Also, what specific programs in Majoring in music would be most helpful for being a pop, rock, or country singer? Not everyone who succeeds in the genres you mention were or are music majors. But music theory, applied lessons on an instrument/s and business, marketing, networking, and entrepreneurial skills as well as internship opportunities are all highly useful for what you want to do – and music school can offer you that along with mentors who can help you find your way. Look at popular music, music industry, as well as performance programs with an emphasis on your main instrument to see possible paths to pursue. If I am a third year in high school, and I decide to major in music now, do I have a chance anywhere? I have not taken any CMs, and I am in two orchestras as of right now. I don’t have a private teacher at this moment. We are not sure what CMs are, but if you are interested in majoring in music, we suggest you take some private lessons as soon as possible. We also suggest you sign up for a summer music program (see MajoringInMusic’s 2015 Summer Music Camps & Programs list). Summer music programs can really speed up your readiness to audition in the fall. You’ll be auditioning for placement in conjunction with students who have been taking private lessons and performing, so anything you can do to prepare now would be worthwhile. If you’re a strong student who can manage their time well, you can actually do both. Consider going to a school where you can be a double major. Or where you can minor in music. Or where as a science or engineering major you can join whatever band or orchestra suits the instruments you most enjoy playing – and maybe also take lessons. Check out this article on double majoring: Dual Degrees, Double Majors, and Music Minors. Also see this article: Music or Medicine? Great Tips for Doing Both. Remember that you will be more successful at what you are passionate about. And that doesn’t have to be just one field. Some people seem to have the performance skills, business savvy, and ability to communicate and network without college. For the rest of us, going to music school helps to hone performance skills, networking skills, communication skills, business skills, and more – all of which are essential to success in any field of music. To really benefit from music school, one needs to be an active pursuer of what they need to learn in order to do the work they want to do. They can’t wait for it to “come to them.” Note that in addition to teaching, many music faculty are also active performers and are therefore excellent mentors to their students on many levels. What if you wanted to pursue music as a career? Maybe playing in a symphony or what not. Would it be financially suitable or would it be a part time thing? I love music more then anything, and I want to pursue it, but would it be worth it? What kind of options do I have career wise? Check out this article, What Can You Do with a Music Degree –– and note that all of the linked options will take you to specific articles about careers in those particular fields. Whether you’ll be able to make all or part of your living through music depends on many factors – including the areas you’re trained in, how diverse you are in what you can offer, the networks you create and maintain. Musicians, especially recent graduates, typically find that they need training in how to market themselves as well as more than one income stream to be able to pay their rent, buy food, pay for gas, etc. It’s not unusual to supplement work in music with a part-time non-music job. To be able to get through music school as well as ride the waves when you graduate, you’ve got to be really passionate about music. If you’re not sure, you can always minor in music and keep music in your life by performing alone and with others.